This list provides an overview of books concerned with illustrations, graphics, photographs, etc. on music subjects. 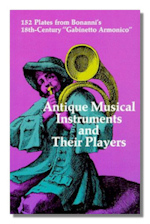 Antique Musical Instruments and Their Players. Filippo Bonanni. Dover Publications. 1964. ISBN 0486211797 (paperback). Great Composers in Historic Photographs. edited by James Camner. Dover Publications. 1981. ISBN 0436241327 (paperback). 244 Portraits from the 1860's to the 1960's, arranged alphabetically, from Abt to Wolf. Each photo is accompanied by brief biographical information. Great Conductors in Historic Photographs. edited by James Camner. Dover Publications. 1982. ISBN 0486243974 (paperback). Photographs and brief biographical information for 193 conductors from 1860 to 1960. Great Instrumentalists in Historic Photographs. Edited by James Camner. Dover Publications. 1980. ISBN 0486239071 (paperback). 274 Portraits from 1850 to 1950 with brief biographical information for each picture. Great Opera Stars in Historic Photographs. Edited by James Camner. Dover Publications. 1978. ISBN 0486235750 (paperback). 343 Portraits from 1850's to 1940's. 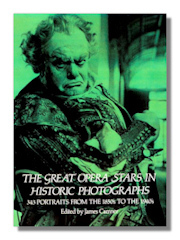 Stars of the Operas in Photographs. Edited by James Camner. Dover Publications. 1986. ISBN 048625240X (paperback). Decorative Music Title Pages: 201 Examples from 1500-1800. Gottfried S. Fraenkel. Dover Publications. 1968. ISBN 0486219151 (paperback). Ready-To-Use Old-Fashioned Music Illustrations: Copyright-Free Designs. Carol Belanger Grafton. Dover Publications. 1990. ISBN 0486263053 (paperback). 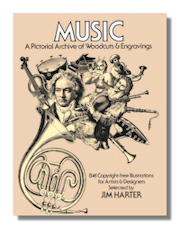 Music, a Pictorial Archive of Woodcuts and Engravings. Selected by Jim Harter. Dover Publications. 1980. ISBN 0486240029 (paperback). Musical instruments with and without the performers, many from 19th century periodicals. An artist and collagist, Jim Harter includes 841 illustrated images of the 19th century for artists, designers, professional and amateur craftpeople to use. Over 100 types of musical instruments are also featured. Copyright-free. Ready to Use Performing Arts Illustrations. Fred Marvin, editor. Dover Publications. 1986. ISBN 0486251845 (paperback).